First step is to preheat the oven to 475°F, next lightly spray a nonstick baking sheet with olive oil spray and set it aside. Now place the chicken piece on a cutting board and cover it with a sheet of waxed paper. Now using the smooth side of a meat hammer, pound the chicken piece to a uniform thickness of about quarter of an inch. 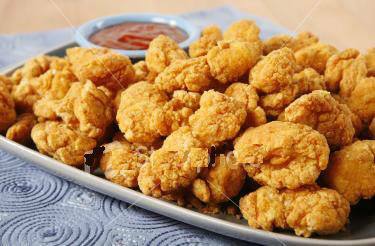 Now uncover the piece of the chicken and cut it into 24 to 25 even sized pieces. Take the flour, sugar, ½ teaspoon pepper, ¼ teaspoon salt, and the onion powder and mix it well place the mixture in a bowl now add the chicken pieces and coat the chicken pieces well with the flour mixture and set it aside. Now in a small bowl mix the egg whites and the milk. Beat the mixture with a fork until it becomes smooth. Next is take the full quantities of the bread crumbs and place it on a small sheet of waxed paper and keep it next to the egg-milk mixture. Taking one at a time, dip the flour coated chicken pieces into the egg-milk mixture making sure to coat the chicken piece completely and allow the excess coating to drip off. Now dip the coated chicken piece into the bread crumb to coat it completely by turning it on both sides in the bread crumb. After you are done with all of the chicken pieces dip a second time into the egg-milk mixture and the bread crumbs. After you are through with the process place the chicken pieces on the nonstick baking sheet prepared earlier making sure that they’re not touching each other, now spray the chicken pieces with olive oil spray lightly and season lightly to taste with salt and black pepper. Bake the chicken pieces for 5 minutes and flip the chicken pieces. Again bake for 5 to 7 minutes. KFC usually does not bakes the chicken pieces instead they pressure fry them. If you have the arrangement for the pressure frying then you may enjoy this recipe in much better way. This entry was posted in Food and tagged chicken, food, homemade, popcorn chicken, recipe by Miss P. Bookmark the permalink.